Thank you for stopping by. Thanks for all your prayers and encouragements. I thank God for everyone of you. I do apologize once again for my inability to visit your blogs yet. I missed all of you and you are in my thoughts and prayers. I am not able to return to active blogging yet as I am still learning to pace myself and there are much to be done with the things on hand. During this period of short break from blogging the Lord has continue to deal graciously with me. This morning the Lord filled my heart with praise and thanksgiving as I recounted afresh His goodness and mercies in giving me rest and salvation while I was yet a sinner and my soul was weary with sins. After saving me, He continues to give me rest in Him along this pilgrim journey. My walk with the Lord has many ups and downs but I have found the rest that our Lord spoke about and He gives me strength for each new day. So I could not resist but post my Word-Filled Wednesday and Thankful Thursday to share with you God's goodness and mercies to me, and to us who belong to Him! ♥ I am thankful to God that He bids us to come to Him and He promised to give us rest. ♥ I am thankful to God that when we turn our eyes upon our Lord Jesus Christ, the things on this earth then seems strangely dim. Thank God that we can have the blessed hope of being in eternity with Him to worship Him, enjoy His love and fellowship. Let us then run with patience the race that is set before us, looking unto Jesus the Author and Finisher of our faith. ♥ I am thankful to God for blessing me with my family who love me, a church who loved Christ and me, and so many friends and blogging friends who love Christ and me. I thank God for each and everyone of you! May God bless you always in your kindness to me. Hope this encouraging hymn will bring comfort and encouragement to us as we remember afresh God's love for us in giving us the Lord Jesus Christ to die for our sins and to reconcile us to Him. When we are weary and troubled, let us Turn our eyes unto Jesus. Thank you for stopping by. My apology again that I am not able to return to active blogging yet and therefore will not be able to return visits to you. But know that I appreciate your visit and will remember you in prayers. Take care and may God continue to bless you through this week! I'm so proud of you for listening to your body, to God's asking you to put things in order and allowing yourself the space to do that! Know that I pray for you daily and send love and peace your way! Praising Him for your joy through it all! This was such a lovely post sweet friend, please take care. Hi Nancie, another lovely post! I certainly agree that when we turn our eyes upon Him, everything else on this earth seems so dim. Hope you are having a good break. Will be thinking of you. God bless! After saving me, He continues to give me rest in Him along this pilgrim journey.... Amen. Amen. Amen. I am thankful that you have so much to be thankful for!! WOW...this is such an awesome blessing...Nancie...it's so beautiful to see your Thankful Heart & your beautiful verse on REST in Him! I pray that is exactly what you are doing! Beautiful song also...so as we turn our eyes upon Jesus, I am looking fully in His wonderful face, and thanking God that you are pacing, praising and dealing with all your circumstances with your eyes turned to Him! May you continue to be strengthened & filled and more ups than downs! Looking forward to a gradual reentry to the blog world. I looked earlier for you but was so blessed when I saw your name just now on TT! Thinking of you daily & more important...praying! So are others! you have a beautiful list of thankfuls, nancie. God is good and we can trust Him to take care of us always. God bless you, nancie. I love the words to this song and it was my favorite worship song to sing along with my husband as it played it ever so beautifully on his piano. Such a soothing and comforting flow of the holy spirit assurance that no matter how everything around us can seem so out of control, that if we keep our eyes upon the Lord and stay focused on him, we can walk through everything with peace in our spirit. Hope all is well with you and I continue to keep you lifted up in prayer. Thank you for sharing such a heart warming post. It touched my heart especially right now with what I am going through right now with my health. I love the song Turn your eyes upon Jesus. Have a great weekend!!! God truly is a wonderful God, blessing us and giving us the strength to get through when we think that we can't. Hi Nancie! Don't worry about visiting other blogs; you do what you need to do to take care of you. Let the Father guide you! Love the post, love the song, love you! I'm so glad you are resting. And I thank God for your thankful heart. I'm praying for you. Blessings to you! Your post was an absolute joy to read. Praying for you and hoping you have a happy Thankful Thursday! Oh, Nancie... such a lovely list of blessings! We are so fortunate to serve such a wonderful God, aren't we? Don't worry about visiting blogs... you need to take some time and listen to your body and the Lord. You are such a blessing to us all. We want you to take care of yourself. Nancie! I missed you!! Thanks for posting, and catching us up a lil' bit. I pray that you are doing ok, and I hope there is sunshine in your day! I missed your comments last week but I trully understand so it is ok if you don't comment. Just know that you are being thought of. Another blogger has problems being on the computer because it may cause seizures for her. Just take good care my friend & be blessed. Oh sweet thing, I understand! Don't you worry about it. You take care of you, allow the Lord to minister to your needs. We all know you love us. You take care. Blessings to you, as always a lovely post. 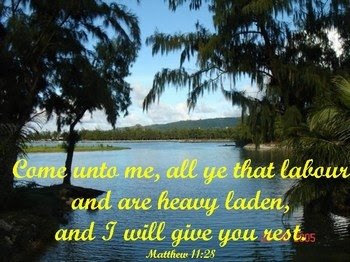 Be blessed as your rest your heart, soul, spirit, mind and body in the Lord Jesus Christ. Hugs and Blessings to you Nancie! May the Lord continue to carry you in times you need Him most. You are always in my prayer.